You are beautiful, you and us know that, but what about getting more beautiful using some tech-tricks? Let me provide you with some of the best beauty camera apps for Android, along with some techniques to take better photos, to show your real beauty with your friends and family. Google Play stores have thousands of beauty camera apps, but you may be confused about which one is the best. Don’t worry! In the following, we will introduce 8 of the most popular selfie camera apps for Android, no matter which one you choose, you will be impressed by its beauty effects. We will begin with BeautyPlus – a free photo editor & selfie camera that makes your photos much better with its huge number of features it provides. 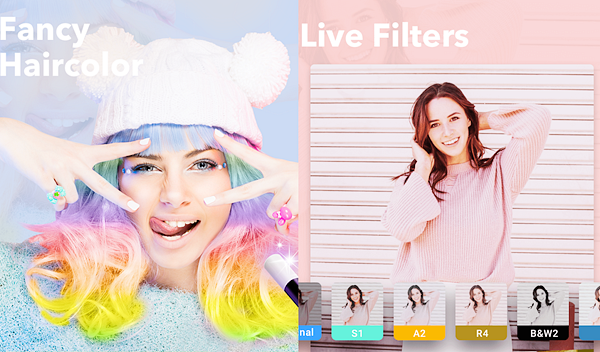 BeautyPlus has a number of filters so you can choose any from them, along with many editing tools like adding volume to your hair, editing eye colors, adding a radiant complexion, and more. The beauty camera application is used by more than 300 million users who like to take selfies, edit photos and videos, etc. It also has some features like artistic effects, augmented reality filters, and a Skin Editor function that lets you optimize your photos to the upper limit. This beauty selfie camera app is available for free to download, as well as some in-app purchases that you can purchase. YouCam Perfect and YouCam Makeup focus on two fields of photography and photo editing. If your photos are already beautiful and you just need to add some makeup as if you were an electronic makeup artist, I recommend you using YouCam Makeup – the best beauty photo editor. And if you are someone who is keen on taking perfect photos with special effects and filters, your choice will be the beauty selfie camera- YouCam Perfect. Along with the effects YouCam Perfect provides, it also allows you to smooth your skin using Skin Smoothener feature, and to add some stickers and text to them. Moreover, you can crop, adjust, collage, focus, and even remove unwanted objects from your photos within clicks. 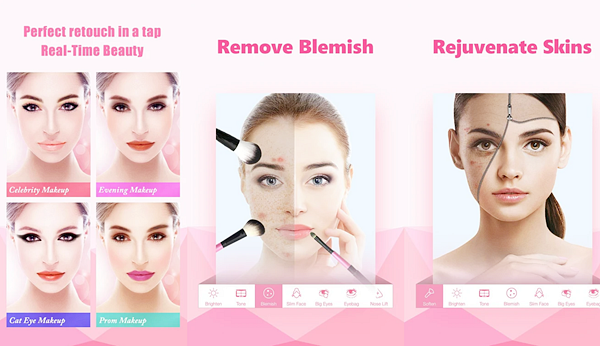 The most important feature of these two face beauty camera apps is that they provide you with Real-Time skin beautifying effects for the real-time events and feasts like the latest Halloween effects, filters, and costumes they’ve provided. YouCam Makeup provides almost the same features of YouCam Perfect, along with its Makeup effects that allow you to use the best makeup tools from the top brands to add to your beautiful face. This beauty photo editor also has a great feature called Skin Analysis, it gives you a full report of your skin, including spots, dark circles, and more. Besides providing many accessories to add to your photos like glasses and others. These two beauty cameras apps can be downloaded for free, but you can buy more effects, skins, and filters to use with your photos using in-app purchases. This is surely one of the best beauty camera apps for Android on the market and it’s my favourite selfie camera app too, B612 has more than 1,500 diverse stickers, and it’s common with its facial recognition stickers like those used on SnapChat. It also has a huge number of effects and filters with high quality to take the best photos and selfies. 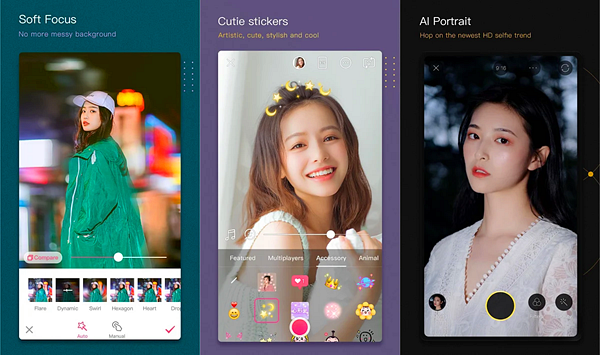 You can also edit your real-time taken photos, or edit photos from your gallery, and you can create collages to save your best moments together. What’s more, with this beauty camera app, you can create music videos with many sound effects included, and you can even turn yourself into emojis using AR Emoji feature. The B612 beauty camera app is completely free with no in-app purchases which is considered as a plus. One of the best beauty camera apps on Google Play store, as it has very special features for those who have some issues with their bodies. Mainly, it has many filters and effects to use to edit your real-time and already saved photos, along with a great set of makeup tools for girls. But what makes this beauty camera more distinguished is the Haircolor, Body Reshape, and Muscle Editor features it has, so you can rebuild your body and take very funny photos of yourself using the Sweet Camera app. You can also collage your photos to save your memories together, and add 3D Tattoo to your body, with a numerous number of effects made it one of the best beauty camera apps on Android at all. Sweet Camera is totally free, and you can download it from Google Play store without paying a cent to benefit from its huge number of features. Another makeup application that offers you a great number of professional tools to edit your face. 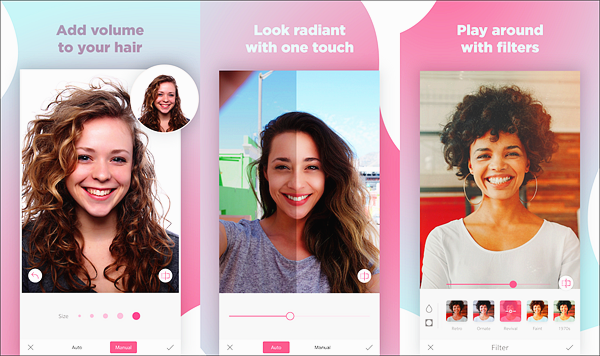 This face beauty camera app is targeting girls only, and you can really make great changes to your face using it. It has a feature called One-Tap Makeover which lets you change your whole face color and others within a click of a button. You can also remove the blemish, rejuvenate your skin, brighten it, and even making your eyes bigger and more beautiful than ever using InstaBeauty. It’s a beauty expert on your phone. Moreover, you can use it to whiten your teeth, appear taller and add artistic effects along with a huge number of features and effects that you can benefit from to create beautiful memories. One of the best beauty camera apps too. 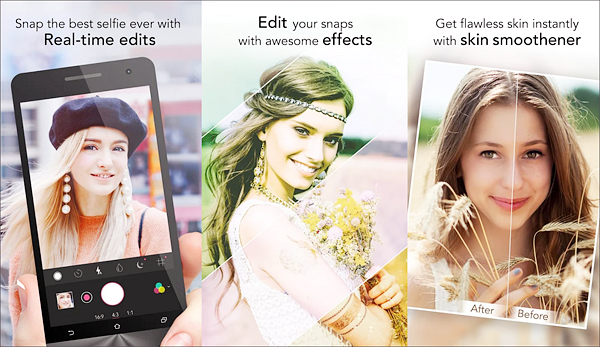 Sweet Selfie provides you with numerous numbers of filters and effects, along with its special features that distinguish it from the others. You can use Sweet Selfie to whiten your teeth, add funny stickers to your photos, change your hairstyle (for men and women), and create stylish collages to save and share your memories with one touch. Sweet Selfie is downloaded and installed by more than 1 billion users worldwide, and it was the best selfie camera app of 2016 on Google Play store for what it offers. 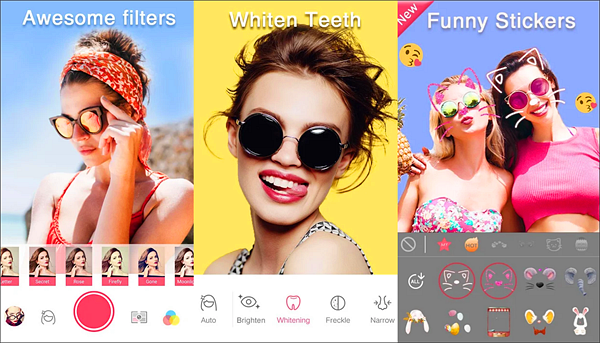 Bestie offers a number of features that make it one of the best beauty camera apps on Android. It offers stunning filters for Portrait mode, along with real-time skin beautifying effects. It also allows you to add animated stickers to make your photos funnier, and accessories like jewelry, headdress and other ornaments. This beauty selfie camera has the great feature that allows you to optimize your photos with a click of a button using Quick-Fix feature, and it can auto-detect your face to use the animated emojis it provides. The application is suitable for those who love to take photos alone using the rear camera, as it has a timer function that can be set to take a photo after 3 to 10 seconds. Bestie beauty camera app is free to download, but it has some ads that may be annoying without providing an in-app purchase to remove them. Finally, we come to the latest beauty camera app for Android on our today’s list. 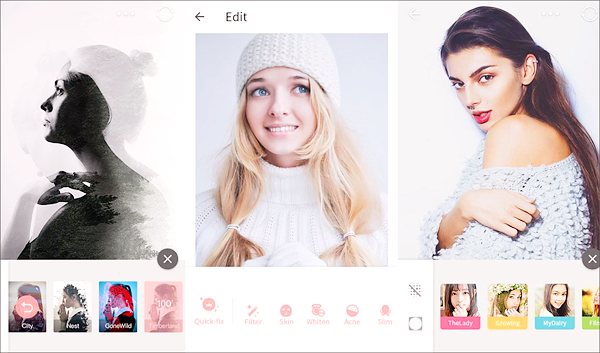 BeautyCam is another application that provides many features like AI Portrait with SLR-Quality HD photos, Soft Focus, MovieCam, and High-Quality filters. You can also add cutie stickers to your photos, including characters and accessories like crowns and glasses. 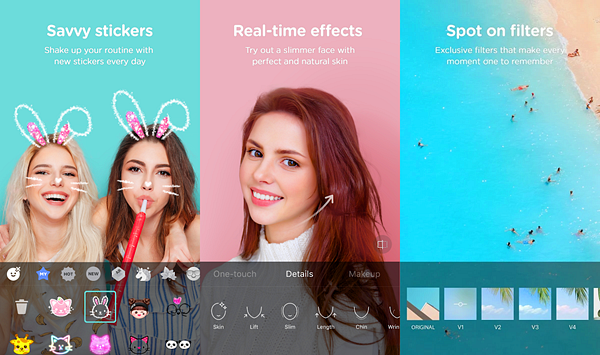 You can download BeautyCam for free and use its huge number of features, and fortunately, it has neither in-app purchases nor ads, meaning you will have the full ads-free experience without paying a cent. Have you ever used any of those apps and falsely lost your photos? 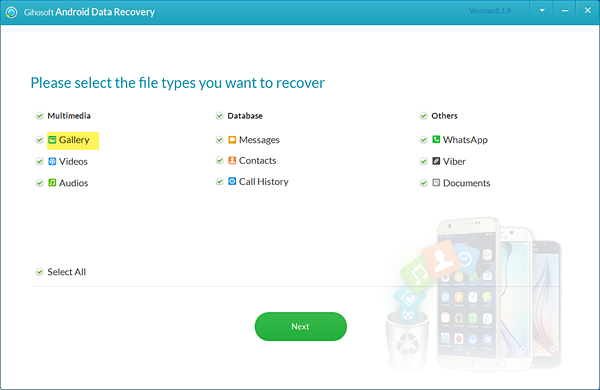 Don’t feel sorry for that, and start downloading Gihosoft Free Android Data Recovery software now to recover deleted photos, and retrieve your best moments made with those best beauty camera apps on Android. Those all apps can make your photos better than ever, but it all depends on some factors when capturing your photos. Always try to take photos in a good light, use a plain background, use flash outdoors, and look for the right angle of the light. Now take the photo, and leave the rest to one of the apps from our best beauty camera apps on Android list.